Basseterre, St. Kitts – Minister of Transport the Honourable Ian “Patches” Liburd has announced that the traffic lights mounted in various strategic locations in the Basseterre area will be officially commissioned and turned on Monday, Dec. 18. While speaking on the government’s weekly programme, “Working for You,” Dec. 13, Minister Liburd stated that a traffic-flow study was done to determine the feasibility of traffic lights around the busy intersections of Basseterre. 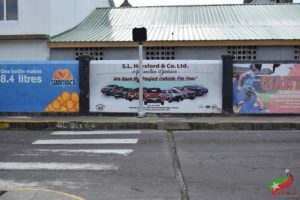 The study concluded that traffic lights were needed in major intersections in the town area: Fort Street, Cayon Street, Victoria Road, the Bay Road, Wellington Road and East Independence Square Street. 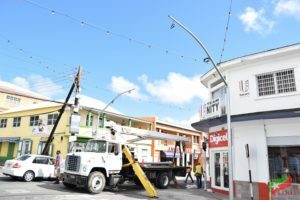 He said that the traffic lights mounted around Basseterre are only Phase One of the project at an estimated USD$572,000. Phase Two of the project will look at installing lights at upper Wellington Road, Sandown Road and the upper Bay Road. A town hall meeting for the commissioning of the traffic lights will be held Dec. 14 at 7 p.m. at the Old Boys School on Victoria Road to sensitize the public on the operation of the lights. Further public education awareness on the traffic lights project has already begun at some schools in Basseterre.